Can you believe another month has gone by? Last Saturday I turned 4 months. Grrr baby yeah! Alden celebrated his 4-month b-day in his Grizzy coverall. I had a huge accomplishment today! 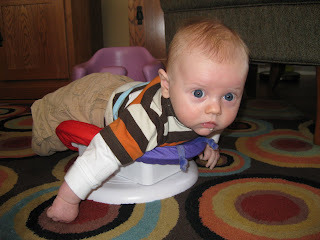 I rolled over from my tummy to my back for the first time. Mom has been encouraging me by singing "Rolling, rolling, rolling, get those babies rolling..." I've spent weeks training for this event including lots of time on my baby turntable. "You Spin Me Right Round (Like A Record)"
As you can see from the picture, I am really enjoying my drool hobby. I also like to blow raspberries, make spit bubbles, and babble. 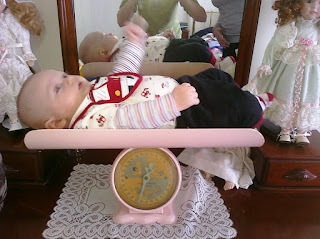 Last week I got to try out a circa 1950 baby scale while at Miss Nicole's house for a play date. Her scale has been used on 3 generations of their family. I was very honored to take a turn on it. It said I am 16.5 lb. My Mom is looking forward to my doctor's visit next month to see what her scale says. I am not looking forward to going back to that crazy place again! Hanging out on a 60 year-old scale. That's it for now. Have a great Oscar night everyone! Mom and Dad have spent so much time hanging with me that they have not even seen any of the movies up for awards. PS - Since I splash too much during my Hydrotherapy skin cleansing sessions now, I am no longer going to Kitchen Spa. I have now upgraded to Bathroom Spa.